President Barack Obama and his family visited Yosemite earlier this summer to mark the National Park Services centennial. 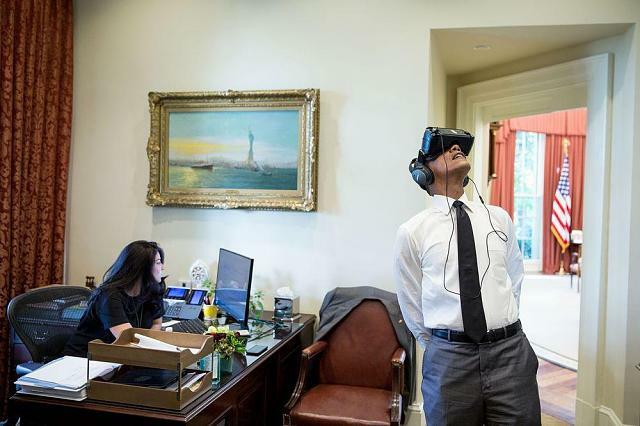 Now, the rest of us can experience his second feature in a virtual reality film. The Facebook-owned Oculus and Felix and Paul Studios released the 11-minute, 360-degree film on Thursday titled Through the Ages: President Obama Celebrates Americas National Parks. The footage includes six days worth of the presidential visit, all with a narration from Mr Obama himself, who takes the time to take photos with children and warn of the looming threat of climate change. We know that protecting and preserving places like Yosemite, and all of our National Parks, is more important today than ever, he says in the film. As we look ahead, in the coming years and decades, the changing and rising temperatures mean that birds and mammals who made their home at Yosemite for thousands of years are moving to escape the heat, he says in the film. In a Facebook post coinciding with the film's debut, Mr Obama said that the park is one of the most stunning places he has ever been to. He also encouraged people to visit their nearest National Park this weekend, as admission is free through Sunday. Felix Lajeunesse, co-founder of Felix and Paul Studios, said in a statement that filmmakers were inspired by the idea that national parks were originally established for all people at all times. Just downloaded it, will check it out at work today.